A Lokpal Bill may or may not be implemented. Even if it is, it will take time to set up the system. However, a young Indian could start a website tomorrow to expose corruption, says Prashant Agrawal in his article in Livemint.com. According to Prashant Agrawal, a principal at a management consultancy, who writes on public policy issues in India and internationally, Flipkart.com isn’t the Indian website of 2012. Neither is Snapdeal.com nor are any of the other Internet companies receiving big venture capital money. And the corruption fighter of 2012 isn’t Anna Hazare or Arvind Kejriwal or the comptroller and auditor general of India, Vinod Rai. Rather the website of the year and the corruption fighter of 2012 are one and the same person. What it would take to win the war against corruption? Prashant Agrawal contemplates about India’s following the example of two Russian websites, Rospil.ru and Navalny.ru. 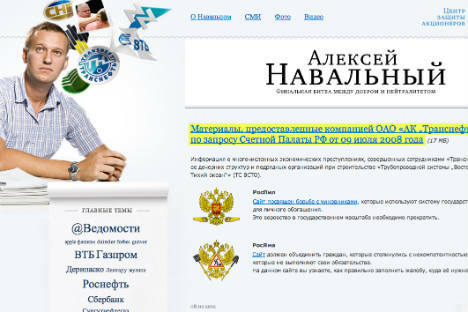 Run by a Russian corporate lawyer, Alexey Navalny, who was also one of the unofficial leaders of Moscow’s December demonstrations against alleged parliamentary polls vote rigging, the sites aim to expose the corrupt practices in the Russian system. His basic principle, somewhat similar to WikiLeaks, is to set information free. Due to their significant impact in Russia, Navalny has focused his efforts on state-run companies (or companies with heavy state involvement), and the government. Because of Russians being fed up with corruption, Navalny’s website has become a hotbed of corruption complaints and is finding an ardent following. He now has over 100,000 followers on Twitter. Agrawal writes that for India, as a country whose people has had enough of corruption too, a creation of a website with similar agenda would mean a lot. An independent law proposed by anti-corruption social activists in India, Lokpal Bill, may or may not be implemented. Even if it is, it will take time to set up the system. But if an internet resource akin to that of Navalny is created by a progressive-minded Indian it can begin to expose corruption right away. There are stories about politicians with houses abroad, Swiss bank accounts, posh cars and a luxurious lifestyle. And most of people believe these stories but no one offers any proof. In Bollywood the columnists have a smart way around offering proof, the blind item. The blind items will say for example which Bollywood star is carrying on an affair with her famous co-star unknown to the co-star’s wife. Based on the blind items it is usually easy to put two and two together for anyone who has remotely followed Bollywood. Delhi’s political reporters could be doing the same thing: which political party leader, a “paragon of virtue”, has recently bought himself a fancy car for his house abroad acquired at an exorbitant price which he shares with his mistress. This example is made up. But the fact is that people would believe blind items about politicians hinting to their dishonest deals or bribes they’re involved in, just as much as they believe blind items about Bollywood stars, if not more. If members of Parliament are corrupt, if ministers are corrupt, it cannot happen in a vacuum, without leaving traces. In Sivaji, Rajinikanth makes a point by saying: find me the auditors, accountants, the No. 2s, the people who work for these politicians. It just can’t be that we all believe that politicians have incredible wealth and yet there is no proof. One cannot own a house in Bali or London without having some documentation. There cannot be lakhs, crores and zillions stored away in Switzerland without some proof. And if a website aiming to reveal the cases of sweeping corruption is set up, it will eventually move from blind items to seen items, it will give proof, if not actively encourage believers in blind items to find it. But this is the work for the persistent and strong-willed. Such a website will trigger massive protest. The powers that be will try to shut it down. Russia’s Alexey Navalny has had many smear campaigns run against him. In the latest one, a photo was shown of him next to an exiled Russian billionaire. Turns out the photo was forged. Navalny has even received threats to his life. An Indian doing the same will face no less pressure. There will be threats of legal action and threats to life. But the one who will have the heart to engage in such a risky project will be rewarded with a huge acclaim and will possibly become the person of the year.